The Covered Life: Go Team Go! Before everyone gets all fired up about why the four teams above were chosen for my picture, let me explain. The four schools in the picture starting from the top left and going clockwise are Appalachian State, North Carolina State, Wake Forest, and Duke. The reason these four were chosen is because these were the pictures I had of our family wearing these schools. See, my husband graduated from App, I graduated from NC State, he is a Wake Forest fan and I'm a Duke fan... yep, that's how we do life. No doubt some of you reading this are very passionate about your favorite sports team. Some of you even now, have words that you would like to say about why we like the teams we do, or why we shouldn't or many other things, some of which probably wouldn't be pleasant. It is for that reason that I wanted to write this post. See I live in North Carolina. For most (not all) people who were born and raised here, this week is a big week for them because they know that it's the ACC (Atlantic Coast Conference) tournament. Believe me when I tell you that I am one of those people. The Friday of the ACC tournament should really be a state holiday in my opinion. ;-) My whole life, well as far back as I can remember, my family and their friends would get together and watch the games on Friday. Now don't think it's because we all root for the same team- because we don't. In my family alone, my mom is a Carolina fan, my dad and I are Duke fans and my sister is a NC State fan. And I married into an entire family of Wake Forest fans. 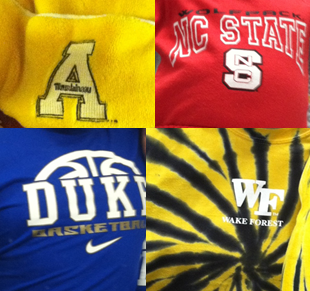 (At least between all the family we have the four NC teams represented!) We are able to watch the games together though, because we cheer for our teams without bashing the other teams. And we realize that it's just a game. If your emotions, attitude, the status of your day changes based on whether your team wins or loses, then you may have a misdirected focus. As Christians, our focus is to be on Christ. When we redirect our focus to anything other than Christ, we elevate that thing (person, event, whatever) above God. And God commanded in Exodus 20:3, “You shall have no other gods before me." Do you arrange your schedule to watch games/play games, but you never have enough time to read your Bible, pray, or go to church? Can you name off all of the star players who have ever played for your team, but you can't name the apostles, Books of the Bible, or the ten commandments? Do you have all the stats for your team and the players memorized but have very few Bible verses memorized? Do you become angry when someone bashes your team but when you hear negative comments about Jesus you are just mildly annoyed? If you answered these questions with anything other than no, then maybe you need to redirect where you have placed your focus. Even if you started trying to justify the answer in your head by rationalizing the answer so it doesn't seem like the wrong one, then you probably need to redirect your focus as well. Our focus needs to be on Christ first and foremost. It's when our focus becomes skewed that we say we love Jesus and other people but then talk trash about them. It's when we are passionate about sports and not Jesus, that we feel we can call the other teams' coaches, players or even the referees ugly names instead of recognizing them as people God created. Being a sports fan and being a Christian are not exclusive of each other. We can still enjoy sports and root for our favorite team; we can even watch the games and know the players and stats, but we must do so under the banner of Christ. Jesus is eternal, but sports aren't. Remember, win or lose, it's just a game.